For those who saw last week’s Tuesday Trivia post, read on for the answer you’ve been waiting for. For those who are unfamiliar with these posts, every other Tuesday, a trivia question will be posted to allow us to test our wits and expand our horizons. As a reminder, the question that was posed last week: Cucumbers and _____(fill in the blank)_____ both consist of 95% water. 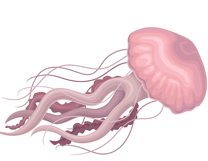 Believe it or not, jellyfish are basically a nervous system and a digestive system with tentacles. As they lack bones, blood, a heart, a brain and many other muscles and organs, they require water to survive and water currents to transport them. For a jellyfish, water is a crucial component for their survival. While humans don’t require water for our daily movements and transport, it is crucial for our survival as well. Click here to learn more. Stay tuned for a new trivia question next week. In the meantime, wrack your brain for your best trivia questions and send them to me in the comments section. We’re eager to expand our horizons! Previous Previous post: Perfluorinated Compounds – Awesome or Awful? Next Next post: Disks or Cartridges – Which Should I Use?